This is our Halloween bash! 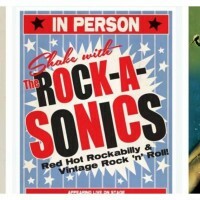 We're very excited to be welcoming Rockville, MD's the Rock-A-Sonics into our area. They are a classic rockabilly band with a fresh new sound that keeps you on the floor wanting more! Our theme this year will be along the lines of traditional B-Horror movie, cult classics. Think Swamp Thing, Dracula, Wolf Man, Frankenstein, Brain Eaters, Jekyll & Hyde, Body Snatchers etc. COSTUME CONTEST WITH PRIZES. SPECIAL PERFORMANCE BY THE LADYBIRDS BLUES/JAZZ DANCE TROUPE. YUMMY FOOD.